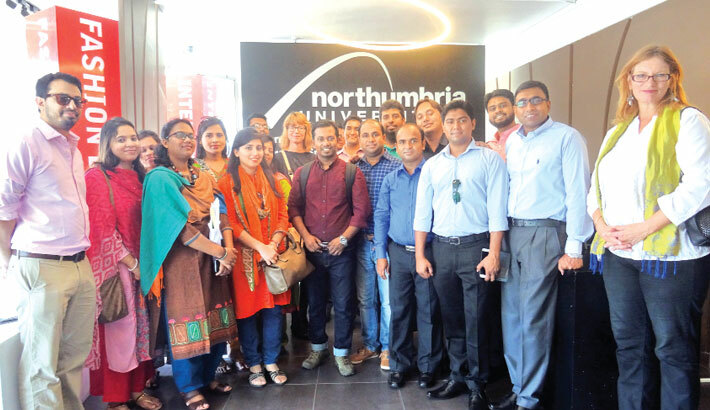 A 16-member team of researchers from BGMEA University of Fashion and Technology (BUFT) made an exposure visit to Sri Lanka from 27th March to 3rd April, 2016 as a part of the Netherlands Initiative for Capacity Development in Higher Education (NICHE) project. The visit was organised by MDF Training and Consultancy which is implementing the project NICHE/BGD/199 with NUFFIC financing under titled “Corporate Social Responsibility (CSR), Sexual & Reproductive Health Rights (SRHR) and Innovative Leadership in the Ready Made Garments (RMG) sector of Bangladesh”. The visit was planned to see how Sri Lankan garment factories are implementing CSR policies successfully. The purpose of their visit was to provide an opportunity to observe and analyse the state-of-the-art practices in CSR/SRHR in a South Asian context and then to implement it in the RMG sector of Bangladesh. The NICHE Team members were - Dr. Swapan Kumar Saha, Mr. S.M. Akterujjaman, Mr. Faisal Bin Alam, Mr. Md. Arafat Hossain, Ms. Farhana Jannat, Mr. Mallick Rakibul Hasan, Mr. Md. Ariful Islam, Ms. Summiya Sultana, Ms. Marjana Jahir, Mr. Md. Maruf Sarker, Mr. Mohammad Mahbubul Haque, Ms. Sarmily Sarker, Anindya Chakraborty, Ms. Sumaiya Benta Nasir, and Ms. Syeda Helmi Afrah, Ms. Kamrun Nahar (Project Coordinator). Other participants were Ms. Ineke Anne Pitts, Branch Director of MDF South Asia & Coordinator of the Project; Ahmad Sajid, Project Implementation Specialist of Mott MacDonald and AKM Ahsanul Haque, Director of Research and Training, CSR Bangladesh.